Lichen Planus is an uncommon skin disease that is non-infectious and affects the skin and mucous membranes. Around 2% of the world’s population is affected by this condition. Usually, men and women aged between 30 and 70 are affected by Lichen Planus condition equally but oral lichen planus is more common in women. This condition is not harmful and goes away by itself. Though there is no cure for this condition there are things you can do at home to reduce the severity of the symptoms. 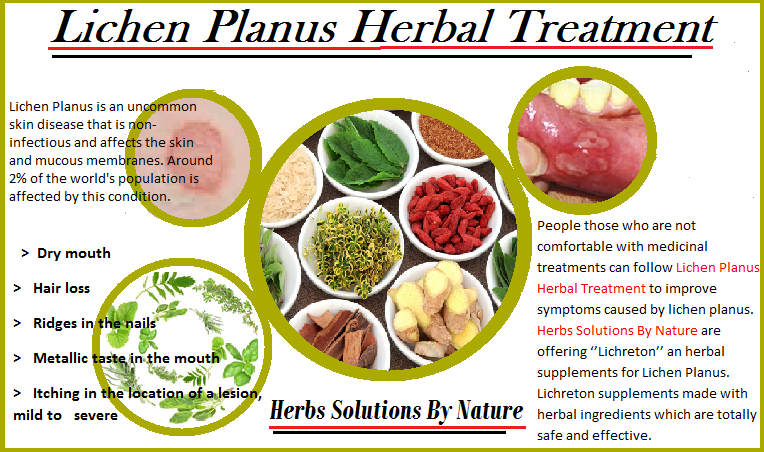 Planus Herbal Treatment have been said to for quick relief. Mouth ulcers also occurs causing soreness that is made worse by hot or spicy food. The exact cause is unknown, but the disorder is likely to be related to an allergic or immune reaction. It can also cause ulcers in the mouth but this is uncommon. The disorder has been known to develop after exposure to possible allergens such as medications, dyes, and other chemical substances. There is also no cure for this condition but steroid creams, ointments, medications, corticosteroids or ultraviolet light therapy, steroid pastes / mouth washes are accessible as a treatment to get relief from itching and to reduce the rash. People those who are not comfortable with the treatments can follow Lichen Planus Herbal Treatment to improve symptoms caused by lichen planus. Turmeric is not just a kitchen spice; in fact it is more than that. It is full with antiseptic and anti-inflammatory properties. Because ages, it has been used to treat a number of skin disorders. You can apply turmeric directly on affected area to accelerate the healing process. Adding ½ teaspoon turmeric powder in your food regularly helps you to get relief from the lichen planus. Like turmeric, basil has been also used for centuries for curing different medical conditions. The Queen of Herbs contains anti-inflammatory, antibacterial and medicinal properties. To treat lichen planus, apply the juice of the basil leaves directly on the affected area every night. You can also chew a few basil leaves to treat lichen planus in mouth or just add fresh/dry basil to your meal. Aloe Vera is an excellent Natural Remedy for Skin Condition. It is considered as the healing plant as it has powerful healing properties. You can discover many skin products in the market that contain aloe vera but using fresh aloe vera gel is the best. The gel can be applied directly to the skin to get relief from the symptoms. Don’t apply aloe vera more than 3 times in a day. Ginger works wonder for treating lichen planus. It also avoids the regular recurrences of the allergy. You can drink ginger tea at least two times a day to heal this condition. You can also apply fresh ginger juice or massage a fresh slice of ginger on the affected area. Applying ginger also removes the scars. Tea Tree Oil contains antimicrobial and anti-inflammatory properties. It can provide relief from lichen planus symptoms of skin and mouth. You can apply tea tree oil and water mixture to the affected area. The combination should be made by adding 5% tea tree oil and 95% water. To get rid of lichen planus scars, apply castor oil on the spots for at least 1 hour. Use this Natural Remedy for Lichen Planus 1 month to get results. Oatmeal brings the inflammation and itchy discomfort connected with lichen planus under control. You can use oatmeal-based creams or take colloidal oatmeal bath to get relief. For colloidal oatmeal bath, fill the bathtub with warm water and add powered oatmeal in it. Then, allow yourself to soak in the tub for 15 to 20 minutes and get out of the tub. Dry your skin with the help of a towel. Herbs Solutions By Nature are offering ‘’Lichreton’’ an herbal supplements for Lichen Planus. Lichreton supplements made with herbal ingredients which are totally safe and effective.